A few weeks ago Little Man was feeling under the weather. He just wasn't his usual happy self. I have a sneaky feeling it might have been hay fever, but I cannot possibly say for certain. 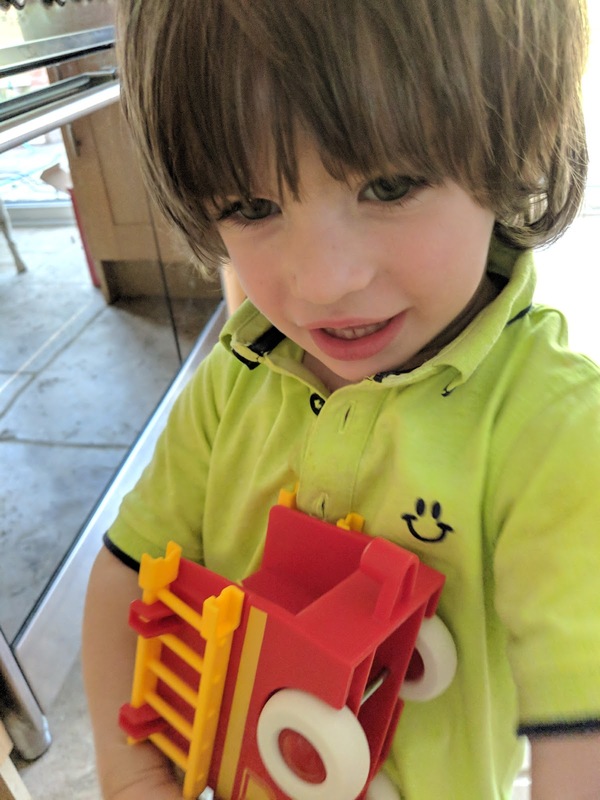 One thing however brightened up his day and that was his BRIO Firetruck. Little Man loves vehicles. All kinds of vehicles. He shouts 'Bus' when he spots a bus, we have to stand in the garden on bin day so he can watch the bin wagon go past and he often demands to go and sit in the car just so he can pretend to drive. He knows what he wants to play with and goes and fetches them for us to play with together. 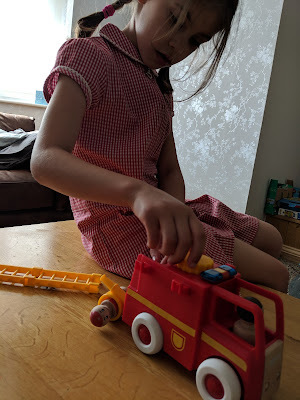 Whilst he was feeling poorly his go to toy was the BRIO My Home Town – Light and Sound Firetruck. The BRIO My Home Town – Light and Sound Firetruck is the perfect size for him to carry. Light weight and well built, he scoops the truck up and carries it to play. The bright red colours are particularly appealing to him too. The contrast with red and yellows make the fire truck even more physically appealing to play with too. The truck stands out against other toys. Little Man knows that anything yellow does something. The yellow ladders can be removed to be played with. The yellow dial turns to wind in the rope. 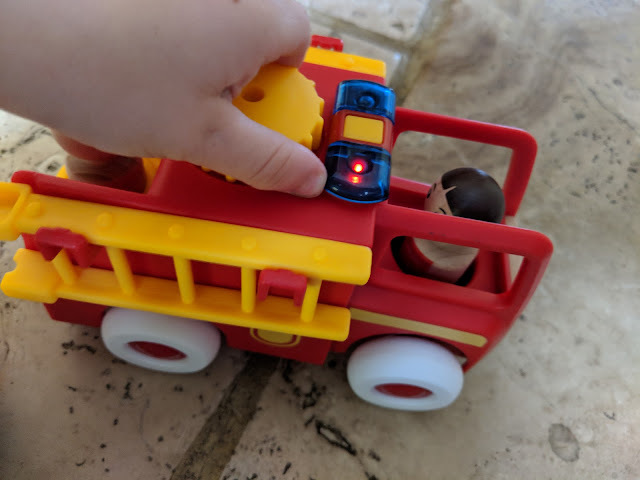 He also knows that pressing the yellow button makes the sirens flash and makes the sirens sound. The BRIO My Home Town – Light and Sound Firetruck also comes with two wooden fire fighters. 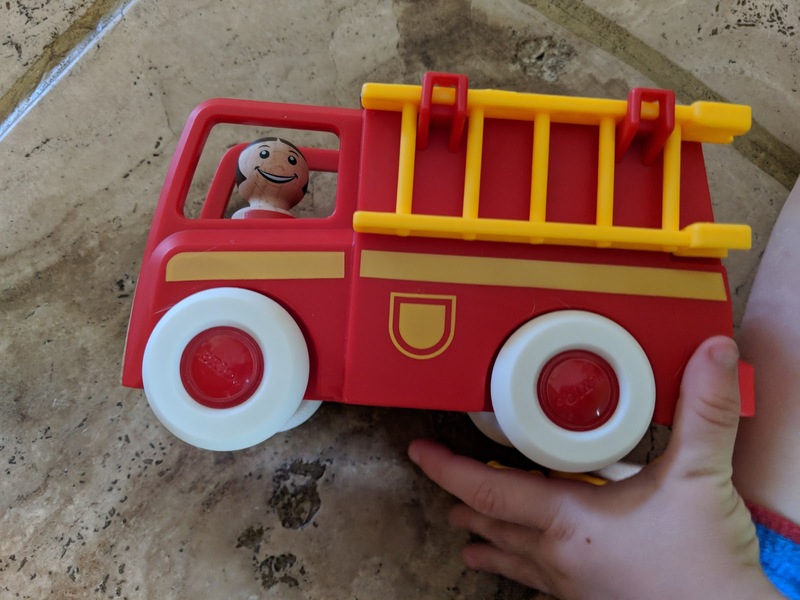 Their happy smiling faces and bright red uniforms add to the joyful characteristics of play and add to the charm of the fire truck. The charm of the fire truck seems to span across the ages as well. I often catch my 6 year old daughter playing with it. It is safe to say it is a toy that helps captures the imagination of all ages. We were sent the BRIO My Home Town – Light and Sound Firetruck for review, all words are my own opinion.